NAIROBI, Kenya, November 1, 2010 (ENS) – Three suspected elephant poachers have been killed, four firearms recovered and five elephants killed in two separate incidents in Kenya during the past week. The Kenya Wildlife Service says more suspects are on the run in both incidents. In the latest incident last night, Kenya Wildlife rangers gunned down a suspected poacher in a fierce exchange of fire on the outskirts of Meru National Park in Isiolo County. “A major operation is underway this morning to arrest other suspects on the run. They are believed to have sustained injuries from last night’s shoot-out,” says KWS spokesman Paul Udoto. Two AK 47 rifles and 30 rounds of ammunition were recovered in the incident at Moliti area, 10 kilometers from Kinna Trading Centre in Garbatulla District, Isiolo County. The suspects had shot an elephant dead at 6pm and were in the process of hacking off its tusks using axes when the Kenya Wildlife Service rangers ambushed them. One Kenya Wildlife Service ranger was injured in the right shoulder during the shoot-out and evacuated to Maua Methodist Hospital where he is undergoing treatment. Doctors said his condition is stable. Plans are being made to airlift the injured ranger to Nairobi for specialized treatment. 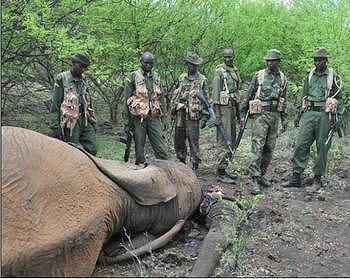 Today, a suspected poacher was arrested in Isiolo, 70 kilometers (40 miles) from the crime scene in Garbatulla. 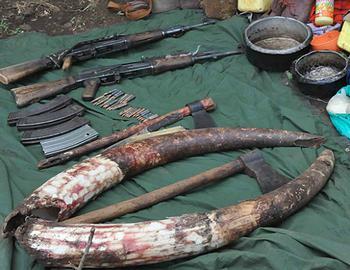 Elephant tusks, guns and ammunition at the Isiolo crime scene. Meanwhile, another suspected poacher is being interrogated in Voi Town near Tsavo East National Park after being arrested in an incident on October 26, in which two of his accomplices were killed by Kenya Wildlife Service rangers. Three others escaped and one AK 47 rifle was recovered. The suspect is being questioned about the killing of four elephants at Galana Ranch and the illegal firearm in his possession. He has been linked to an incident on October 26 at Galana ADC Ranch, when rangers engaged the suspected poachers in a shoot-out and killed two of them. The rangers recovered two pieces of ivory buried in the sand. The dead suspects were found in possesion of five more ivory pieces. The suspect in custody was arrested on Saturday in the Ngao area of Garsen District with a G3 rifle, after he walked 100 kilometers (60 miles) from the poaching scene in Galana. The African elephant, Loxodonta africana, is listed as Vulnerable to extinction by the IUCN Red List of Threatened Species maintained by the International Union for the Conservation of Nature. African elephants currently occur in 37 countries in sub-Saharan Africa and international trade in elephants and their parts has been banned since 1989 by their listing on Appendix I of the Convention on International Trade in Endangered Species, CITES. The African elephant is subject to various degrees of legal protection in all 37 range states. The IUCN says that although up to 70 percent of the species’ range is believed to lie in unprotected land, most large populations occur within protected areas. Although large tracts of continuous elephant range remain in parts of Central, Eastern and Southern Africa, the IUCN says that elephant distribution is becoming increasingly fragmented across the continent.